12-year old star Akeem Gregory-Thompson kicked out of World Open!! Akeem Gregory-Thompson has been heralded as the best young talent that has come out of the Philadelphia area in recent years. He entered the World Open with high expectations, but his tournament ended in turmoil. World Open organizer Bill Goichberg expelled Akeem from the tournament when he was accused of striking 14-year old phenom IM Hikaru Nakamura (2511) in an altercation. Goichberg ruled against Akeem (1729) when he discounted witnesses supporting the contention that Hikaru initiated the incident. 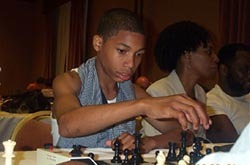 Akeem Gregory-Thompson playing blitz at the 2002 World Open. It started when Akeem was bouncing a ball outside the skittles room, apparently irritating Hikaru. Words were exchanged and when the ball bounced away from Akeem, Hikaru allegedly grabbed it and walked about 100 feet down the hall. At this time, a group of young chess players (including Akeem) had caught up to Hikaru and what happened next is in dispute. What was clear was that there were provocative words and taunts were exchanged. Sources say that Hikaru (then against the wall) had slapped Akeem on the left side of the face after which Akeem responded with a punch to the jaw. Hikaru then covered to protect himself after which bystanders intervened. FM Sunil Weeramantry, Hikaru's stepfather and a very successful chess coach, went to Goichberg to lodge a complaint. After hearing what he claimed was a "preponderance of the evidence," Goichberg threw 12-year old Akeem out of the tournament. A crowd gathered next to the Tournament Director's office in protest. Although Goichberg did not see the incident, his rationale was that Akeem's supporters were not as credible as those who stated Akeem threw the first punch. Scholastic players, which included stars Igor Schneider (pictured below in white t-shirt) and Shirley Ben-Dak (pictured below in blue jacket), contended that Hikaru initiated the incident and that expelling Akeem wasn't fair justice. Shirley Ben-Dak explaining the situation to Bruce Thompson as crowd looks on. Photo by Daaim Shabazz. The real point is whether both parties should have been given a warning (since the incident didn't affect the tournament in any way), some type of probation for a certain number of tournaments, or expulsion of both players. Most of the bystanders listening to the testimony felt that Hikaru, one of America's brightest stars, was given preferential treatment given his status and his stepfather's influence. Hikaru set a U.S. record by becoming the youngest Master in history at 10 years old. He has also appeared on the cover of U.S. Chess Life twice in the past several months, so throwing him out would cause an outrage. Bystanders were demanding that Akeem be reinstated with a bye in the round not played, or that Hikaru also be thrown out. Goichberg appeared to be biased and irrational in his reasoning when pressed to explain his decision. Could it have been possible that bystanders witnessing Akeem's punch did not see the whole incident? Perhaps. Is it reasonable to believe that Hikaru would not defend himself at all when hit by Akeem (that is if he didn't throw the first punch)? After discussing the matter with Bruce Thompson, Akeem's father, Goichberg agreed to provide free passage to a future tournament instead of refunding the entire $250 entry fee. Editor's note: When one throws a 12-year old chess player out of a chess tournament, things have gone entirely too far. Akeem, who has a passion for the game, had to spend the rest of the tournament roaming around watching others play. Why contribute to killing a child's passion for the game by meting out such a harsh penalty?? In no way did this incident affect the tournament and in my mind Goichberg has committed a very serious error. Any chessplayer of integrity can see this.